The subdivision of 891 acres into 94 market-rate residential lots, 15 lots or units for inclusionary housing; continuation of the existing equestrian facility open to the public on a 20.2 acre lot; and 783 acres proposed as open space. The project applicant is September Ranch Partners. The project would create 94 market-rate residential lots. The project application was deemed complete in 1995. A four year extension was requested through 2016 to allow the developer’s time to find funding for the project. The project was approved by the Board of Supervisors in November 2010. The Final Environmental Impact Report was released in July 2006 and Errata (1.2M PDF file) was released in September 2006. The Draft Revised Environmental Impact Report (6.9M PDF file) was released in December 2004. The Notice of Preparation was released in January 2003 and circulated for 45 days. 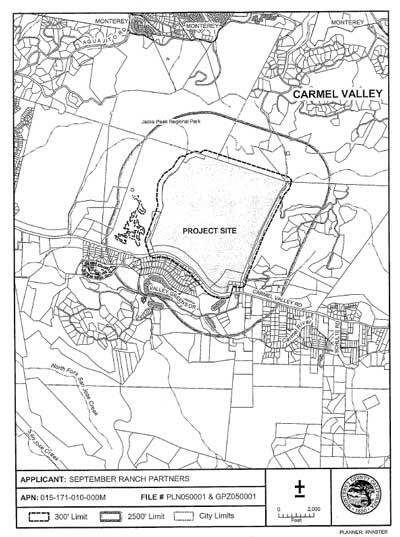 The 1995 project was approved by the Board of Supervisors and then challenged by the Save Our Peninsula Committee. This map shows the September Ranch project location. The Environmental Impact Report was released to the public just three business days prior to consideration by the Monterey County Planning Commission. The project’s EIR does not have adequate mitigation measures and defers mitigation to future plans. “Recommendations” or “should” do not rise to the level of performance standards. These mitigations must be mandatory to meet the level of performance standards. The project requires the replacement of Monterey-pine coast live oak forests at a 3-to-1 ratio is unrealistic and yet without it, there would be a finding of significant impact on biological resources. The mitigation measure was dropped in the Recirculated DEIR and there should be a finding of significant impact on biological resources unless new mitigation measures are added.